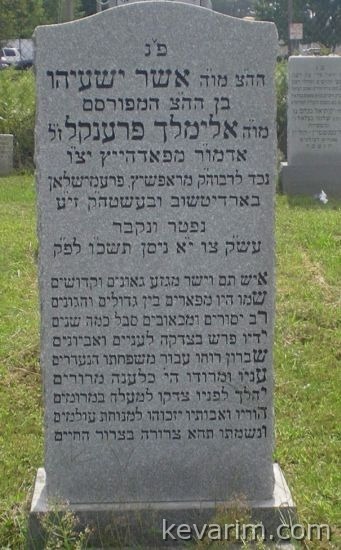 The “Pudhietze” Rebbe of Williamsburg was the son of Rabbi Alimeilech Frankel of Pudhietze, as listed on his Matzeive he was a descendant of the Primishlan, Ropshitz, Barditchev dynesties up to the Baal Shem Tov. He lost his family in WWII and never remaried, he suffered a lot here, he lived in Williamsburgh where he was accepted in the Satmar comunity. In Europe the Rebbe was known a respected Admor and talmid chocham. Sadly, during the war his entire family was murdered and he never recovered from his anguish. I believe that Rebbe Yoel Teitelbaum the late Satmar Rebbe had great respect for him. Rebbe Tzvi Hersh Frankel, (d. 1855) author of Degel Machaneh Ephraim was the son-in-law of Rebbe Meir (the second, d. c1840-1850), Premishlaner Rebbe who was a grandson of Rebbe Maerl Premishlaner (d. 1773) the student of the Bal Shem Tov. Never heard of this sefer, as well as I dont find this on Hebrew Books site, what is the sefer based on?